This is an excellent warming up exercise in order to improve the team spirit. Due to the many passes they have to give are your players obliged to handle with each other. I refuse to give a name to this exercise because you should name it after your team. This will once again improve the team spirit. Please notice the position of the coach on the court. This will give the players more encouragement than when your acting like the regular passive coach, sitting on the bench and reading his journal !!! 2 fills the line of the runner (to eventually make the basket). 1 leaves the scene and waits in the next line. 3 dribbles to the top, passes to 2 and moves in to take the rebound. Please mark that I'm not speaking of real game-alike rebounding. The rebounder should give faith to his mate and presumes his mate will score. 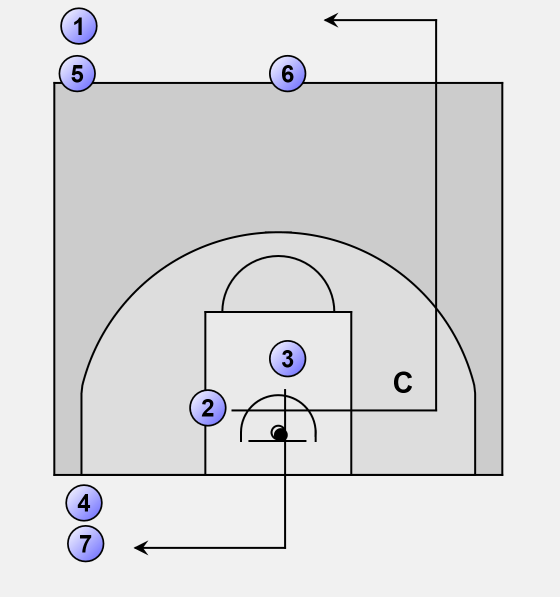 --> In the second option I gave before 2 shouldn't make the basket, but 5 should tip him in. 3 takes the rebound and waits in the next row. 2 fills the next row, passing by the coach. --> In the second option 5 should run as 2 does but he has to get back in the line he came from. Now to give the "tip-in-pass"